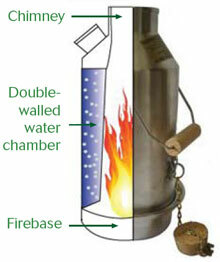 KELLY KETTLE - Camp Kettle boils water and cooks food in outdoors fast in extreme weather conditions. Save with Discount Club Prices! 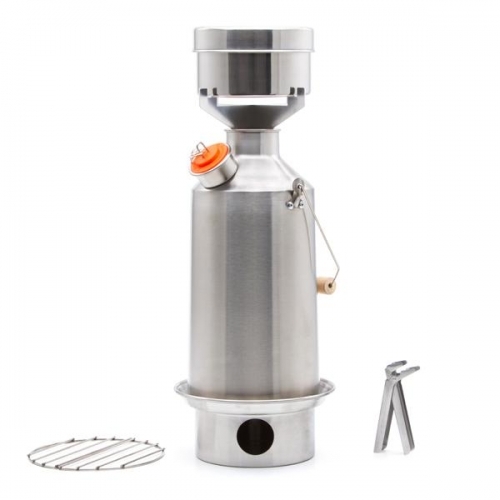 This kit includes a large Stainless Steel Kettle (includes Stainless Steel fire base), Stainless Steel cook set (includes small pot, pan/lid, 2 grill pieces & pot gripper handle) & Aluminum Pot Support all of which fit neatly within the kettle itself for transport or storage. A useful drawstring carrying bag is supplied with each kit. The most reliable, ultra-fast camping kettle for the outdoors! Kelly Kettle® Base Camp Stainless Steel Kettle holds 50.7 fl. oz. (1.5 liters or 6.3 cups) of water, plus the cook pot holds an additional 32 fl. oz. (0.85 liter or 4 cups) of water and/or can be used at the same time for cooking soups or etc. Note: The Pot-Support & Cook Set are suitable for cooking quick cooking items such as soup, boil-in-the-bag, hydrating food, noodles, rice and etc. For more details on how best to use the Pot-Support and Cook Set, please go to our Kelly Kettle® Frequently Asked Questions page. Family Picnics, Scouts, Emergency/ Disaster Preparedness Kits and etc." The Kelly Kettle® (also known as the Volcano Kettle®) will boil water in 3 to 5 minutes depending on the fuel you're using. Made from Stainless Steel, it is essentially a double-walled chimney with the water contained in the chimney wall. Once the camp kettle is filled with water, simply start a very small fire in the base, set the kettle on the base and drop additional fuel (twigs, leaves, grass, paper, etc.) down the chimney. The large internal surface area of the chimney heats the water very quickly. When the water boils, "hold the handle at an angle of 90° to the kettle - then lift the kettle clear of the base." To pour, lift it by the handle and tilt it using the cork chain. If additional water is required, simply refill the kettle with water and place it back on the base when the fire is still burning. Refill the chimney with fuel and you can look forward to a second kettle full of boiling water within a matter of minutes. Our kettles work in even the most extreme weather conditions - in fact, they work better in wind so there is no need to find shelter when brewing up! Note: When the kettle is in storage, the cork should be left out of the spout to allow air circulate in the water chamber. Always remove the cork before lighting the kettle. The cork is only to be used for transporting cold water. The water spout should be free of ALL obstructions when the kettle is in use. Boiling the kettle with any obstruction in the water spout can result in a burn to the user or others in close proximity. Never use the kettle when the water chamber is empty. Note: This new model kettle has a new high visibility Silicon stopper instead of a cork. Never Carry Fuel Again - Be Prepared...!